NationBuilder comes out-of-the-box with a number of tools and page-types that lend themselves to the use of game mechanics. These tools (including Leaderboards, Followers/Followings, Political/Social Capital, Activity Streams, etc) all normally run in the background or supporter nav of NationBuilder-powered sites. Gamification is the use of game thinking and game mechanics in a non-game context in order to engage users and solve problems [thanks wikipedia]. Over the past year we’ve experimented with a handful of different clients on how to best leverage NationBuilder’s built-in gamification tools to improve the amount of time users spend on the site, and the number of activities they participate in. To begin, the most important determinant of success or failure of our game is it's exposure to the "players". 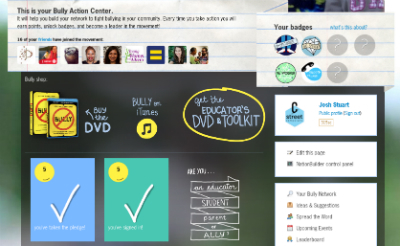 We did this with “tiles,” which are front-facing transactionalized actions that supporters can take on the homepage. Putting these on the homepage – as a central part of the user experience – has been absolutely critical. Second, people love badges. We provided an immediate reward, validating the players' actions and giving them immediate feedback. We designed different interactions that supporters can undertake, which are rewarded with badges that are displayed on their profiles. 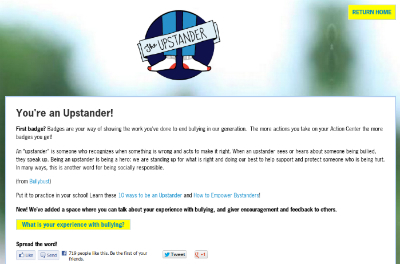 The first badge, awarded to all supporters who pledge to take a stand against bullying, has garnered 300+ comments in the first 2 weeks since it went live. Finally, supporters need to get used to the ‘game.’ It’s critical that the actions we created correlated with the Bully Project's outcomes and that their supporters were comfortable with the actions. 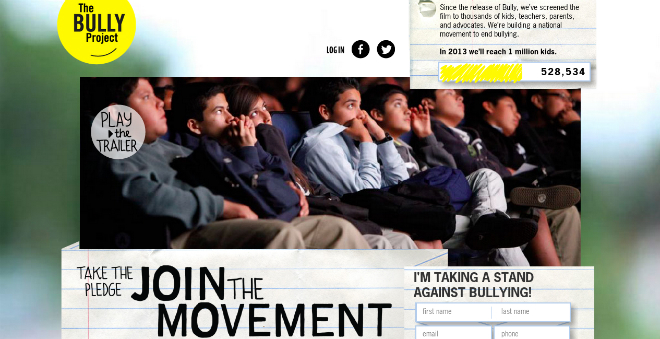 For The Bully Project, we started by rolling out a series of simple, clear actions that included things like connecting Facebook & Twitter accounts and taking an anti-bullying pledge before asking people to take more involved actions. This is important for supporters, allowing them to adjust to the game mechanics and feel a sense of progress.